More commonly occurs in middle-aged or elderly adults; however, can occur at any age. More commonly bilateral, but could present with unilateral symptoms (e.g., chemotherapy drugs associated with peripheral neuropathy include vinca alkaloids, taxanes, platinum-based drugs, dilantin, and thalidomide). Figure 1: Panoramic radiograph acquired due to discomfort in the lower right molar region, with history of numbness in the lip. The patient (62-year-old female) had a history of breast cancer. Despite conservative restoration and no caries, the dentist completed endodontic treatment. (a) Radiograph prior to root canal shows a periapical radiolucency in the mandibular molar with a conservative occlusal restoration and no evidence of active caries. (b) Endodontics completed despite lack of dental disease in the molar tooth. 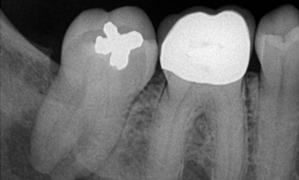 (c) Panoramic radiograph shows persistence of radiolucent lesion following endodontics. Following treatment, there was no change in symptoms; the case represents metastasis to the jaw. Figure 2: Radiographs acquired due to report of jaw pain and numbness in the lip. The patient (68-year-old male) had a history of treated prostate cancer. Radiolucent lesion present extending to the inferior border of the mandible with risk of pathologic fracture. Early stage pain/numbness may be initially intermittent, then progressive and persistent. Pain can range from asymptomatic to severe. Obtain thorough medical and dental histories: inquire about onset, duration and progression over time, history of trauma, daily patterns (if episodic and cyclic), things that make symptoms better or worse (e.g., eating, swallowing, talking). Perform a comprehensive head and neck examination and intraoral examinations. Obtain appropriate radiographic imaging (dental films, CT, MRI, ultrasound, and plain films). Examine for local and systemic signs of infection (pain, swelling, erythema, lymphadenopathy, fever, etc.). Diagnosis is based on a clinical exam, medical history, appropriate medical laboratory testing (that may include biopsy of identified lesions), and diagnostic imaging (that may include dental and medical imaging). If dental conditions are ruled out, refer to appropriate specialist to rule out infection, tumour, systemic disease, or distant malignancy. Systemic disease (e.g., MS, diabetes, severe vitamin deficiency, severe anemia). Systemic conditions generally have bilateral or multiple sites of involvement, although at onset may have asymmetrical localization. Infection: Common initial treatment for potential dental/oral pathology: if fluctuant, open swollen area and drain. Dr. Epstein is director of oral medicine in the division of otolaryngology and head and neck surgery at the City of Hope, Duarte, California, on staff at the Samuel Oschin Comprehensive Cancer Institute at Cedars-Sinai Medical Center in Los Angeles, California, and maintains a private practice in oral medicine in Vancouver. Dr. Saunders is the medical director, department of dental oncology, Sudbury regional cancer program, Sudbury, Ontario. D’Silva NJ Summerlin DJ, Cordell KG, Abdelsayed RA, Tomich CE, Hanks CT, et al. Metastatic tumors in the jaws: a retrospective study of 114 cases. J Am Dent Assoc. 2006;137(12):1667-72. Cristofaro MG, Giudice A, Conangeli W, Guidice M. Unique and rare bone metastases from occult primary cancer: Our experience. Ann Ital Chir. 2011;82(4):289-96. Zhang FG, Hua CG, Shen ML, Tang XF. Primary tumor prevalence has an impact on the constituent ratio of metastases to the jaw but not on metastatic sites. Int J Oral Sci. 2011;3(3):141-52. Muttagi S, Chaturvedi P, D'Cruz A, Kane S, Chaukar D, Pai P, et al. Metastatic tumors to the jaw bones: retrospective analysis from an Indian tertiary referral center. Indian J Cancer. 2011;48(2):234-9. Daley T, Darling MR. Metastases to the mouth and jaws: a contemporary Canadian experience. J Can Dent Assoc. 2011;77:b67. Friedrish RE, Abadi M. Distant metastases and malignant cellular neoplasms encountered in the oral and maxillofacial region: analysis of 92 patients treated at a single institution. Anticancer Res. 2010;30(5):1843-8. Ryba F, Rise S, Hitchison IL. Numb chin syndrome: an ominous clinical sign. Br Dent J. 2010;208(7):283-5. Epstein JB, Elad S, Eliav E, Jurevic R, Benoliel R. Orofacial pain in cancer part II: clinical perspectives and management. J Dent Res. 2007;86(6):506-18.